Good morning peeps! 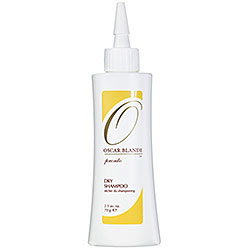 I don't have much to blog about today in family life, so I thought I'd blog about one of my favorite products, Oscar Blandi Dry Shampoo (found at Sephora.com). Anyways, you know how some soups and casseroles are better the second day after? Now, my hair always looks better the second day after washing, all because of Dry Shampoo. I sprinkle some on those greasy, clumpy areas, usually on the top of my scalp only, near my forehead and then style as normal. The best thing, I lose that grease shine, but not the luster and shine that makes the hair look pretty. And, there is no white residue or white-ish looking hair that some products leave behind. If I'm not mistaken, they make this is colors as well for darker colored hair, not sure? I love this stuff. Have you ever tried dry shampoo? And if so, why does it work for you? What brand? I'd love to know! Greasy clumpy hair. Gross. How about oily? I have never tried it but want to, my hair looks so much better the second day but I have yet to try a third. I have recently become obsessed with this stuff. But I think I like the aerosol ones better. I want to try Bed Head product. Live for that hair powder and spray. I tagged you!